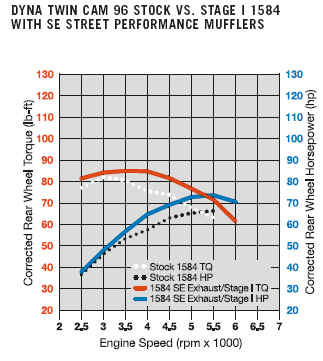 There is more independent proof that you do not need to remap the HD EFI when installing mufflers. 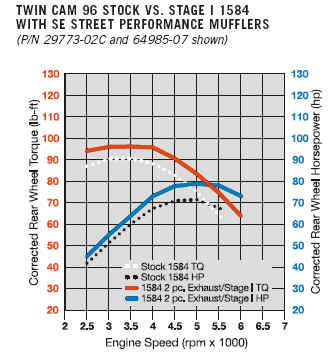 The March 2009 (page 66) Cycle World dyno tested a set of slip-on mufflers on an '09 FLH, getting 5% more HP and 9% more torque on a "bone-stock, including EFI mapping" bike. Cycle World is not known as a big Harley cheerleader, so it would be a reasonable assumption that they are not going to do any special favors for MOCO. The CW information is right in line with what HD published in the Fall 2006 Enthusiast Magazine showing a 3% HP and 7% torque increase with slightly more restrictive mufflers and air cleaner kit. American Iron Magazine has also published similar articles about "no remap" upgrades involving exhaust/air cleaner changes. How much information has to be presented to Harley Riders that remapping of the ECM is not required for exhaust/air cleaner upgrades for closed loop bikes? When it can be shown that much of the "gain" in power for bikes remapped with expensive tuning software and piggyback controllers would have occurred without spending $400-$1000, riders need to start thinking about what they are really trying to accomplish on their bikes rather than blindly following the "you must remap just to add exhaust/ac" advice that has been discredited. Harley-Davidson's new line of 2007 engines is a major shift from previous years. The Twin Cam engine size has grown from 88CID to 96CID with a longer stroke. The HD CVO engines are now 110 CID. There are upgrades to the standard 96CID engine to 103CID by installing a "big bore kit" and to 110CID by installing a stroker crankshaft with the big bore upgrade. All Twin Cam bikes now have 6 speed transmissions. The very problematic cam area has also been re-engineered, requiring different cams from previous years (with the exception of 2006 Dyna models). The 2006 Dyna's and all HD 2007 engines have a reputation for very hot exhaust systems. This problem is well documented for the 2007 FLH's, but does exist on all the bikes. This issue is directly related to the EFI closed loop operation mode at idle and cruising speeds. In closed loop mode, the narrow band O2 sensors used by the Delphi ECU hold the air fuel ratio at 14.7:1 which is good for EPA compliant emissions but creates a very hot exhaust pipe. Nightrider has a fix for this issue that will reduce the exhaust temperature, lower the operating temperature and improve throttle response. Nightrider has come up with a fix for this problem. Read about our orignal fix here. An even bigger change is the fact that all HD's including Sportster, now have fuel injection with dual O2 sensors. This allows the engine to run in a closed loop mode of operation where the fuel mixture is controlled by the 02 sensor. While HD does not publish horsepower numbers in its sales literature for the 96CID (1584cc) or 110CID engines, Nightrider was able to find horsepower numbers from Harley. 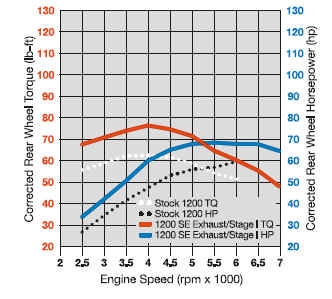 As you can see below on the dyno sheet listed below (Figure 1), the TC96CID engine for Dyna's and Softail'sproduces around 68 horsepower and 83 ft.lb. torque in stock trim. The same bikes with an HD/SE Stage 1 engine makes around 81 horsepower and 96 ft.lb. torque. We have additional HD/SE engine configuration HP/Torque numbers in our Twin Cam HP Gallery. 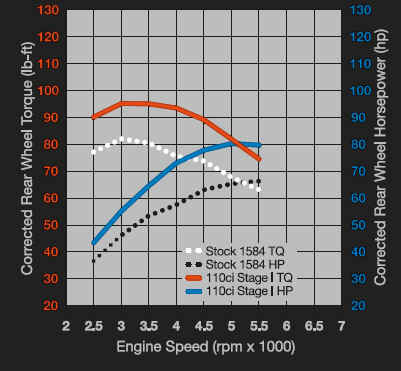 Additional Dyno charts located on FLH based bikes (Figure 5) show the large difference in power. Stock FLH's produce 71 horsepower and 90 ft.lb. of torque. This same engine in HD/SE Stage 1 trim makes 79 horsepower and 96 ft.lb. of torque. The difference in power between Dressers and Dyna/Softails is due to the exhaust system. FLH's have a very large volume in the exhaust system which allows the exhaust to fill this space while the noise is being dampened prior to exiting the mufflers. 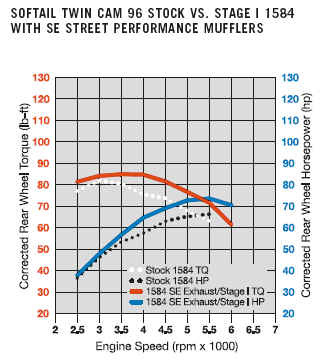 This shows the benefits of a crossover in the exhaust and having larger mufflers. While few riders are willing to put FLH sized mufflers on their Dyna or Softail, it does show the effectiveness of the FLH exhaust in streetable engine combinations. Harley-Davidson did publish some interesting power improvement percentages in the Fall 2006 issue of its Enthusiast Magazine. From the information listed below it must be assumed that you can upgrade the exhaust system and intake system on your 96CID engine without any changes to the ECU. Nightrider has historically been a proponent of exhaust system only upgrades with no EFI remap, but now HD has published that HD/SE exhaust upgrades and no EFI upgrades can be added to your bike without warranty implications. The table below summarizes power improvements as published by Harley-Davidson.